As the government faces its first shutdown since 1995-1996, the standoff between the Obama administration and Republicans over the federal budget is occurring in a different public opinion environment than when President Bill Clinton faced off with the GOP-controlled Congress. The shutdown of the federal government in ’95-’96 took the public by surprise. An NBC News/Wall Street Journal poll taken just weeks before the government suspended all non-essential services on Nov. 14 found that nearly eight-in-ten (79%) thought an agreement would be reached to avoid a shutdown, just 13% thought the two sides would not reach an agreement. Now, after the intensely-partisan standoffs of recent years, Pew Research Center polling has found a very different public mood regarding the current impasse: 46% say a budget agreement between Obama and Republicans will be reached before the deadline, while about as many (45%) say an agreement will not be reached. 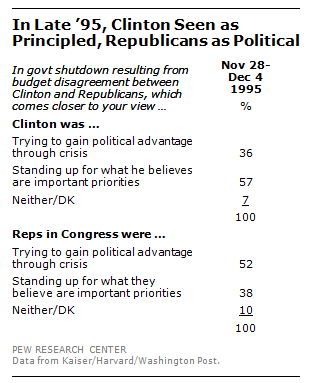 From the outset in 1995, the public saw Republicans as more responsible for the shutdown than Clinton. A November ABC News/Washington Post survey found 49% said Republicans in Congress were mainly responsible for standing in the way of an agreement to end the shutdown, just 34% blamed Clinton, and 13% volunteered that both were responsible. 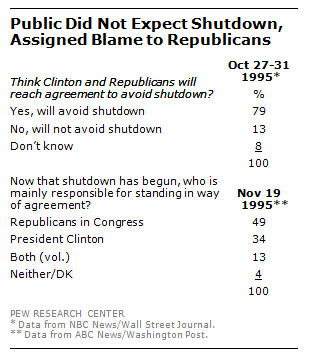 Republicans would consistently take more blame than Clinton for the shutdown over the entire course of events (the government first closed from Nov. 14-19 and then again from Dec. 16-Jan.6). In our latest poll, the public divides blame over a possible shutdown: about as may say the Obama administration would be to blame for failing to avoid a shutdown (36%) as Republicans (39%). In addition to taking more blame for the 1995-1996 shutdown, Republicans failed to convince the public that they were standing on principal rather than using the shutdown for political gain. A December 1995 Kaiser/Harvard/Washington Post poll found that by a 57%-36% margin Clinton was seen as standing up for the priorities he believed in rather than trying to gain political advantage through the crisis. By contrast, Republicans in Congress were seen as strategic rather than principled by a 52%-38% margin. Furthermore, the public flatly rejected using a shutdown to negotiate the budget. 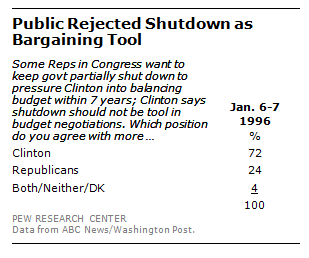 An ABC News/Washington Post poll from Jan. 1996 found that 72% agreed with Clinton that the shutdown should not be used as a tool in budget negotiations, just 24% agreed with some Republicans that the shutdown should be used to pressure Clinton into agreeing to balance the budget in seven years. A recent CBS News/New York Times poll finds a similar current of opinion in today’s debate: fully 80% say that threatening a government shutdown during the budget debates is not an acceptable way to negotiate. The ’95-’96 government shutdown did little to change political attitudes on a major issue at the center of the budget debate – the GOP push to limit the growth of Medicare. Prior to the shutdown, an NBC News/Wall Street Journal poll found 49% said Clinton had the better approach on Medicare, 24% said Republicans in Congress. Roughly three months later – and just a week after the shutdown ended – opinion was nearly identical (51% Clinton, 24% Republicans in Congress). In addition, there was strong support for only limited cuts to Medicare in the context of the budget debate. A CNN/USA Today survey from mid-January of 1996 found that 65% preferred smaller cuts to Medicare and a smaller tax cut to larger cuts to Medicare and a larger tax cut as the best proposal to balance the federal budget. President Obama faces a different set of circumstances today. Pew Research polling finds that Obamacare is unpopular generally; however, the public opposes a proposal to cut off funding for the health care law as part of any budget agreement. In addition, the GOP has drawn even with the Democrats as the party seen as able to better deal with the issue of health care.